Guests and Valley residents are invited to join in the merriment of the holidays at Hyatt Regency Scottsdale Resort & Spa, complete with the debut of their “larger than life” Gingerbread Cottage and a visit from Santa and Mrs. Claus. Hyatt Regency Scottsdale Resort & Spa at Gainey Ranch invites Valley residents to celebrate Christmas Day with a special Christmas Buffet in SWB, a southwest bistro, on Thursday, December 25, 2014. SWB’s Christmas Buffet offers a variety of holiday favorites including: omelets prepared-to-order, Southwest eggs benedict, assorted salads, king crab legs, gourmet pastas made-to-order, roasted turkey, herb and citrus rubbed leg of lamb, and roasted prime rib of beef from their carving station. All of these delicious entree items are topped off with elaborate dessert selections: Christmas yule logs, tiramisu, assorted pies, cakes and tortes, chocolate-covered strawberries, cherries jubilee made-to- order, plus much more. There is even a special buffet just for the kids! SWB’s Christmas Buffet will be served from 10:00 a.m. – 6:30 p.m. and is $75.00 for adults, $37.50 for children ages 6-12 and complimentary for children 5 and under. (Price excludes tax and gratuity.) An á la carte menu is available upon request for breakfast, lunch and dinner. In addition, SWB will feature a dinner á la carte menu from 7:00 p.m. – 10:00 p.m.
Credit card guarantees will be required for all Christmas reservations. For reservations and more information, visit SWB at Opentable.com or call 480-444-1234, ext. 6231. View the menu at www.scottsdale.hyatt.com. Santa Claus and his friends will also visit the resort from 11:00 a.m. – 2:00 p.m. on Christmas Day with gifts for good girls and boys. 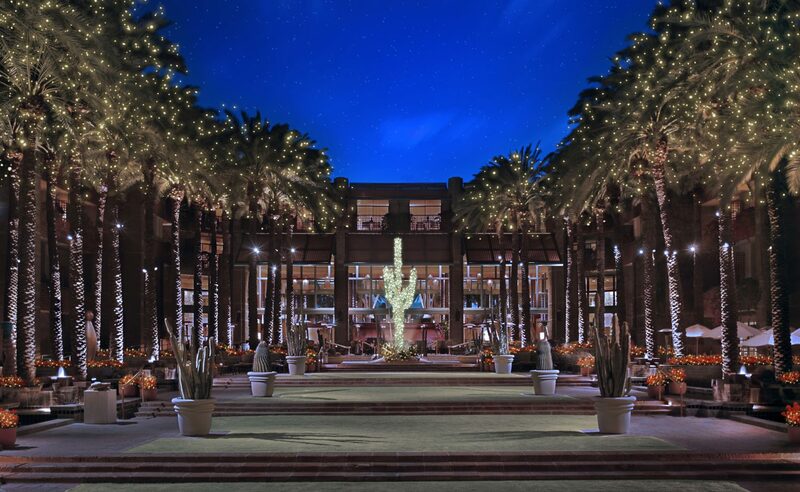 The beauty of the majestic McDowell Mountains, palm trees, cacti, wild flowers, Frank Lloyd Wright inspired architecture, and the spirit of Native peoples combine to create the Southwestern elegance of the Hyatt Regency Scottsdale Resort & Spa at Gainey Ranch. Guests enjoy the many recreational amenities this desert oasis has to offer including the 2.5 acre water playground complete with 10 pools, a 30’, 3-story, high-speed waterslide and its signature sand beach. Additional amenities include 27 holes of championship golf, world-class tennis, miles of jogging and bicycle trails and the award- winning Spa Avania, the first spa experience choreographed to the science of time. Other highlights feature the Native American Learning Center, Camp Hyatt for young resort guests, five distinctly different restaurants, three bars, Venetian gondola rides along the resort’s waterways and nightly entertainment in Center Stage Bar. In addition, this premier meeting venue offers 70,000 square feet of indoor and outdoor function space, providing both quality and flexibility of space. Hyatt Regency offers a full range of services and facilities tailored to serve the needs of meeting planners, business travelers and leisure guests. Properties generally range in size from 200 to over 2,000 rooms and are conveniently located in urban, suburban, airport, convention and resort destinations around the world. Hyatt Regency convention hotels feature spacious meeting and conference facilities designed to provide a productive environment. Hyatt Regency hotels in resort locations cater to couples seeking a getaway, families enjoying a vacation together and corporate groups seeking a relaxed atmosphere in which to conduct business and meetings.